The Disney character Stitch (from the 2002 animated movie Lilo & Stitch) appears in the Kingdom Hearts Birth by Sleep video game for PSP. Also called "Experiment 626", Stitch sometimes makes use of a ray gun. This paper model of Stitch's ray gun is based on a 3D model from KHBBS. The gun is full scale and measures about 7"(17.8 cm) in length. The two page, eight piece template for this papercraft may be downloaded here. I hope to be able to do some more Birth by Sleep papercraft in coming months, so stay tuned! Super Kaiju Hero Force is an original comic book series created specifically for the iPhone and iPod Touch by Crispy Comics. The series follows the adventures of three fanboys who transform into giant monsters like those seen in Godzilla movies. 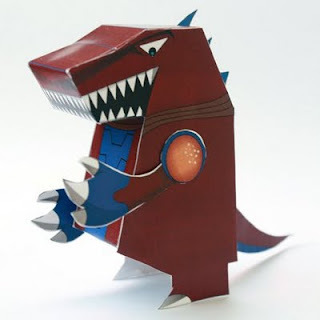 This paper toy by Dadik Triadi is of the character from Super Kaiju known as "Democules". 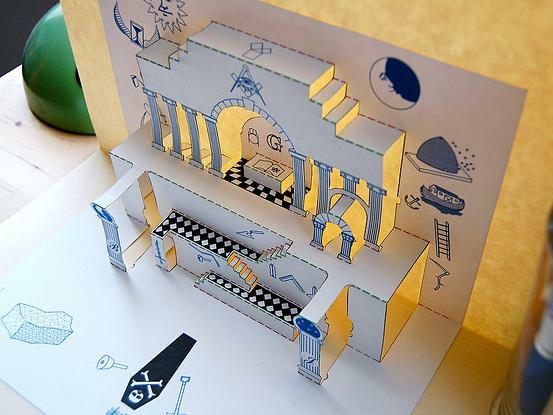 The papercraft template for Democules may be downloaded here. This boxy cat papercraft is just the thing when you have the urge to build something out of paper but aren't in the mood for anything overly complex. 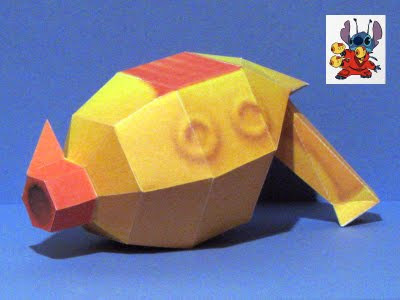 This one piece paper toy is offered by the Goldenrusset blog and may be downloaded here. This paper pop-up with authentic Masonic symbols was created by Guy Spivey, a member of a Scottish Rite lodge in North Carolina. Spivey intended the pop-up to be a 3D "Trestle-Board". A Trestle-Board is a board mounted on a trestle (easel) on which architects in ancient times drew their building designs. In Masonic lodges today, Masonic symbols are drawn on Trestle-Boards instead of architectural designs. The template for this pop-up may be found here. The build photo above is by Sevenworlds16. 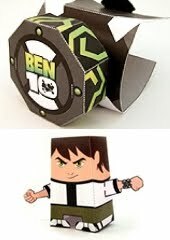 These two items are the first official Ben 10 papercraft from Cartoon Network I have come across. The first item is a papercraft omnitrix watch which includes ten different medallions that can be attached to the face. The second item is a paper toy of Ben himself. In the show, Ben uses the omnitrix to transform into various alien creatures. 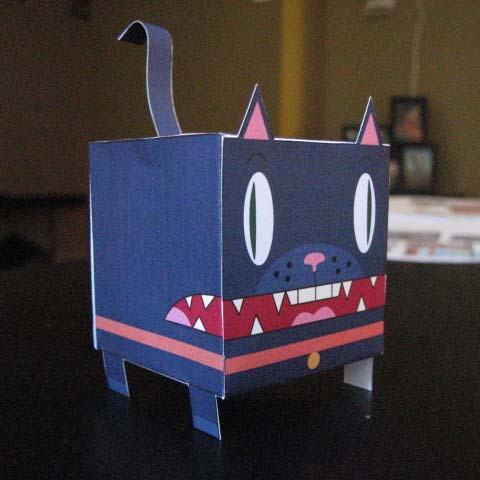 Try as I might, I could not find these papercraft models on the US version of the Cartoon Network website. They appear to only be available on the French version of the site. To get the goods, look for the download links at the bottom of the page here. 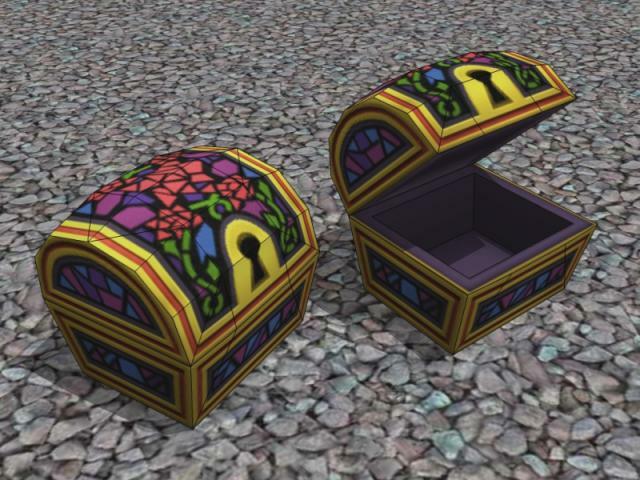 Here is treasure chest papercraft number seven in my ongoing series of Kingdom Hearts 2 treasure chests. This chest can be found in the Beast's Castle area of the the video game. The Beast's Castle area is based on the 1991 Disney movie, Beauty and the Beast. The treasure chest has a pattern of stained glass roses on the lid. A download of the template for the chest is available here. 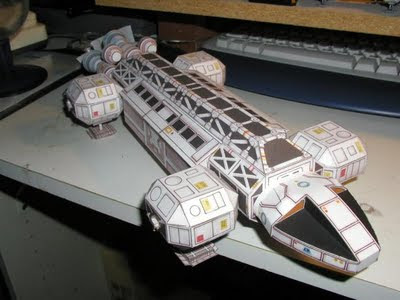 Over the years, I have seen several different papercraft templates for the Eagle Transporter spacecraft from Space: 1999. However, most of these paper models were very detailed and thus pretty difficult to build. Finally, with the release of this papercraft Eagle by DA artist Frohickey, a simpler, easier-to-build version of the Eagle is available. The seven pages of Frohickey's template may be downloaded here. Who can forget Michael Jackson's zombie makeup from his Thriller music video? 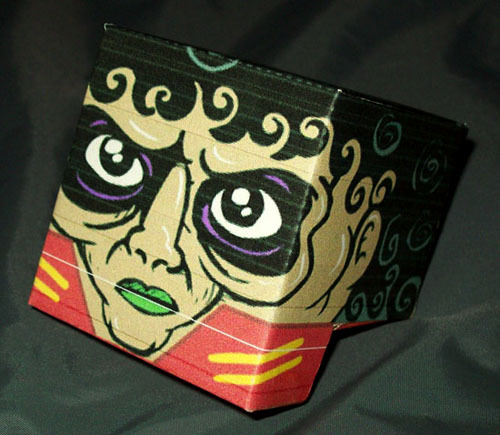 This paper toy of MJ's head was created by the author of the Toca do Caveira website using his blank "cranio freak" paper toy template. Both the blank skull template and the Thriller zombie head template may be downloaded here. Paper models show up in the oddest of places! This 2.5D velociraptor papercraft is a free download at the Spanish language paleontology illustration blog "Las conicas de Pabluratops". 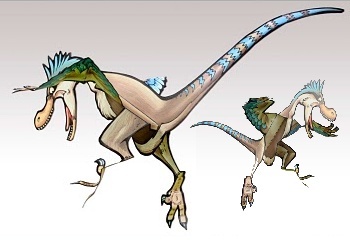 The velociraptor (or "raptor" for short) depicted by the paper model is specifically Velociraptor mongoliensis, named for the fact that several fossils of the creature have been found in Mongolia. In the 1993 movie Jurassic Park, raptors are portrayed as cunning and ruthless killers. A printable template for the dinosaur is available here. Jango Fett plays an important role in the Star War universe. He is the genetic father of both the Clone Troopers and the bounty hunter Boba Fett. 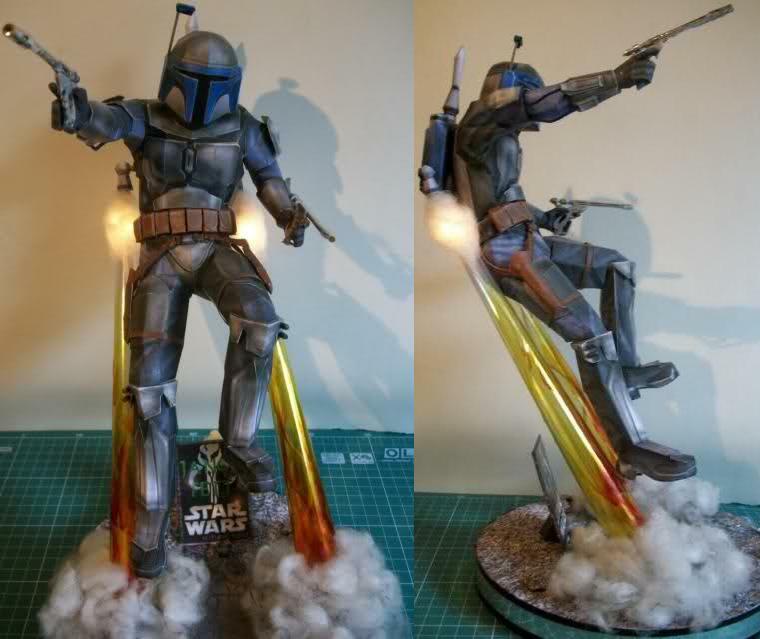 Above are photos of an excellent papercraft model of Jango. 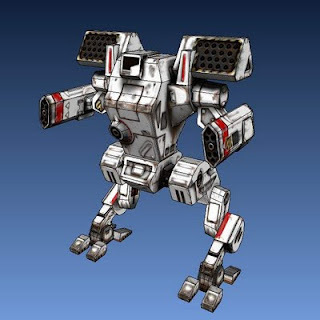 The template for the model was created by Nightcrawler and built by Norturno Sukhoi who added creative details such as plastic rocket trails, smoke created from cotton, and lighted jetpack flames. The Pepakura PDO template for the figure only (base not included) may be downloaded here. Actual ukuleles are small enough, but this papercraft ukulele is really small. 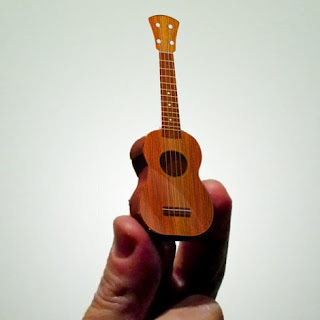 Ukuleles are a Hawaiian invention based on small Portuguese guitars brought to the islands by immigrants. This paper model is the creation of Courts Carter and the template may be downloaded from his website here. Plunk is a Belgian comic series which began in the late 1980's. The central character in the series is a little pink alien from the planet Smurk. 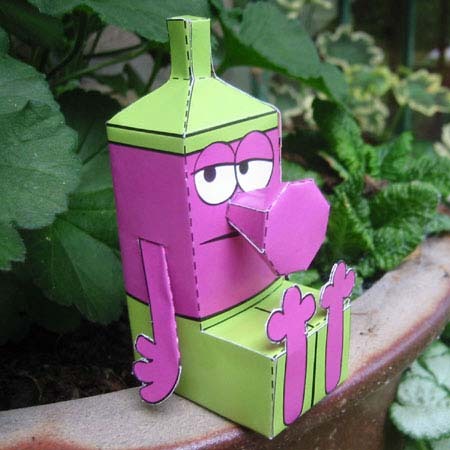 This paper toy Plunk was originally offered by the weekly Belgian comics magazine, Spirou. A copy of the paper toy's template is available on Plunkblog, a blog managed by the creators of the character and dedicated to all things Plunk. One Monk Miniatures has revamped their miniature gaming website and are now offering some free paper models that were not previously available. Most notable among the new offerings is this purple "crypt worm" model. This giant graveyard dwelling worm appears to be a distant cousin of either the sand worms of Dune or the graboids from Tremors. ^^ This and other free One Monk paper models may be downloaded here. 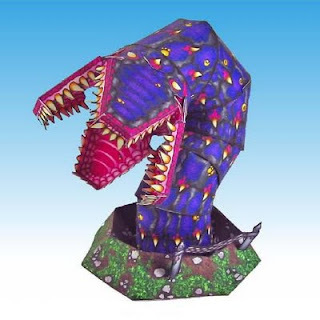 Other models available include crypts, a steampunk tank, a 2.5D Cthulhu, battle cars, and numerous figure flats. On a whim, I took my Eye of Agamotto paper model and made some modifications to create this Millennium Eye papercraft. In the Yu-Gi-Oh! universe, the Millennium Eye is one of seven Millennium artifacts that give their bearers special powers. Among other things, the Eye gives the bearer the ability to read another's mind and to see what their eyes see. 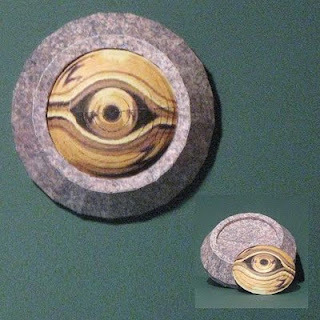 This papercraft is actually two models: the Millennium Eye itself and a carved stone base to hold the Eye. For a smoother look, the Eye in the photo above was built without folding the pieces. The base, however, does have folds. The lined and unlined templates for this papercraft may be downloaded here.